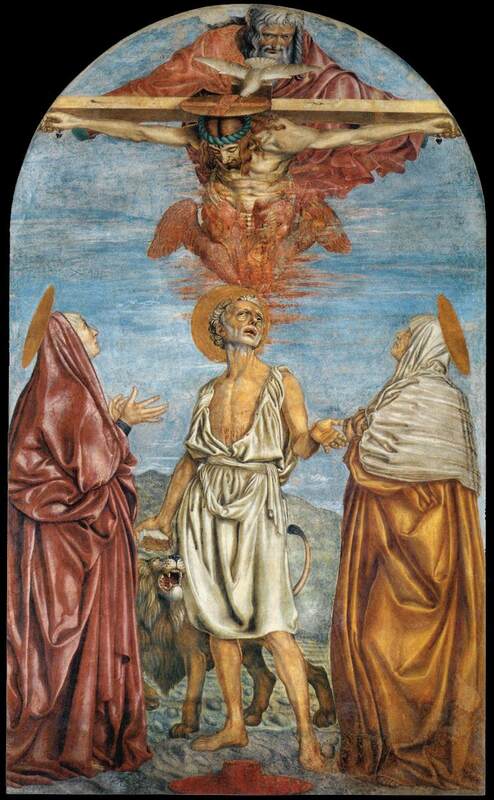 Probably in 1453, Andrea moved to the church of Santissima Annunziata, where he painted two frescoes (St Julian and the Redeemer; The Holy Trinity, St Jerome and Two Saints) that are typical of his late style. No longer interested in the heroic and monumental characteristics illustrated in the Legnaia cycle, Andrea here imbues his figures with the crude truth that he had gradually mastered over a lifetime of hard work. A deeply realistic mood dominates the figure of St Jerome in the fresco in the Corboli Chapel in the Santissima Annunziata. The saint is portrayed as a fully convinced Renaissance ascetic, possessing both humanity and mysticism. In this painting we are immediately struck by a few details that are so realistic they are almost too crude, like the old saint ‘s body with blood gushing out of the many wounds. Above, the Holy Trinity with a Crucifix in foreshortening; it is so well executed that Andrea deserves great praise for it, for he painted foreshortenings in a much better and more modern manner than any artist had done before him (Vasari).